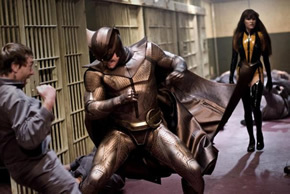 Watchmen is set in an alternate 1985 America in which costumed superheroes are part of the fabric of everyday society. When one of his former colleagues is murdered, the washed up but no less determined masked vigilante Rorschach sets out to uncover a plot to kill and discredit all past and present superheroes. As he reconnects with his former crime-fighting legion – a ragtag group of retired superheroes – Rorschach glimpses a wide-ranging and disturbing conspiracy with links to their shared past and catastrophic consequences for the future. Their mission is to watch over humanity…but who is watching the watchmen? Alan Moore, the author of “Watchmen” had once said that “Watchmen” is unfilmable and not very cinematic in nature. Framed director Terry Gilliam who had once tried his hands in adapting this movie added on that “Watchmen” would at least required a 5 hours miniseries format to bring this fable comic book tale properly to life in a film medium. It’s understandably a tall ordeal for anyone to translate this critical acclaim comic book to the big screen. After numerous attempts, that job finally landed on Zack Snyder’s lap, the same director who just had a box office hit with 300. In his hands, “Watchmen” had been watered down to 3 hours odd worth of materials. In order to fit into a theatrical format, the “Watchmen” film had been edited down to it’s current 2 hrs 43 mins runtime, leaving the rest to be featured as extra in the eventual Director’s cut of Watchmen dvd. 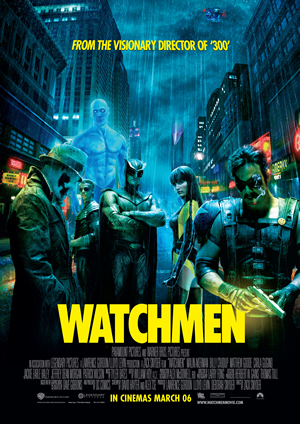 In Singapore, Watchmen had initially received a R21 rating and had to be watered down further to obtain a M18 rating. To be fair, this clean edition that we are getting had been quite deftly censored and we couldn’t spot what had been edited. Although personally, I had not read the book, it felt that Zack Snyder had kept it fairly faithfully to the material. The setting of this movie could have been updated to modern times instead of the eighties; to allow the general viewers to have a better understanding of what’s going on. But the filmmakers stuck to mostly to the source material and gave a unflinching look into a world of superheroes that are filled with various conflicts, not usually dealt with in comic movies such as your neighborhood friendly Spider-man. Each essential characters of “Watchmen” receives adequate focus and are being slowly brought out in stylistic tedious manner that felt like a testament of Zack Snyder’s love for the story and their characters. 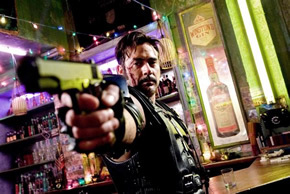 However as what Terry Gillian had pointed out, a complex story like Watchmen would require far more than 3 hours to do it properly and at the end of the movie, it felt that Terry Gillian was right about not presenting “Watchmen” in a movie format. The problem for those who are unfamiliar with the original story and had not lived through or well verse with the Richard Nixon era or American politics back in the 80s, it was a bit hard to immense oneself into what’s going on in the movie. Coupled with the need to focus on the six different characters and their perspectives on the issues at hand, the 2 hours and 43 mins weren’t enough to effectively engage the viewers to feel more for these characters and the story that transpired. Additionally these are not well known characters like Batman or Superman and there seemly not enough time to build up the mythos for these “Watchmen” characters in order to feel what they are going through. Personally Zack Snyder’s Watchmen did well enough to introduce the comic classic to the general audience and excite one into finding out more about the world of “Watchmen”. However there is something lacking in this film edition of “Watchmen” that I feel could only be fulfilled by the director cut of this film or the actual graphic novel medium.